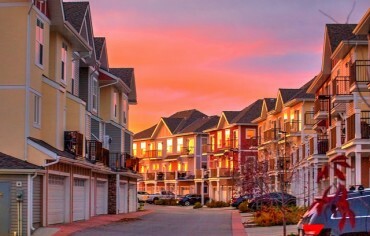 Quarter after quarter, Canada has seen home prices rise in many of its real estate markets, which raises questions about how homebuyers are adapting to this breakneck pace. Have they adjusted their searches to new home prices? Point2 Homes Canada has looked at homebuyers’ browsing behaviour on the portal over a period of three months, analyzing a sample size of six million browsing sessions, and noticed that a reasonably clear profile begins to form. 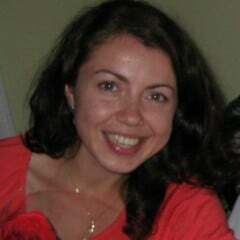 Women form the main search group, as 60% of searches were conducted by them. Age-wise, millennials make up the largest percentage of home seekers, nationwide, while generation X occupies the second spot. A quarter of searches—the highest percentage—focus on homes priced between $300,000 and $400,000. This falls under the national average price for a Canadian home, which is roughly $500,000. Many of the largest cities in Canada show a gap between search expectations and the local market reality. In Toronto, most potential homebuyers are looking for homes a lot cheaper than the city average ($400,000 compared with $750,000). Vancouver provided the same surprise—the majority of searches stayed under the $750,000 limit, while the average home price is $1,055,000. Homebuyers may not be willing to spend in tune with market demands, but that doesn’t mean they’re willing to sacrifice living space. Most searches targeted homes with three or four bedrooms. On Point2 Homes, out of approximately two million monthly visitors, the majority is made up of women belonging to the 25 to 34 and 34 to 44 age groups. This strengthens the most recent findings issued by the National Real Estate Association, according to which the real estate industry is faced with a paradigm shift in terms of target audience. Millennials are becoming a very important segment of homebuyers. In the three-month period analyzed by Point2 Homes, 25% of all Canadian homebuyers searched for homes priced between $300,000 and $400,000. That means anywhere between 20% and 40% cheaper than the national average of around $500,000. 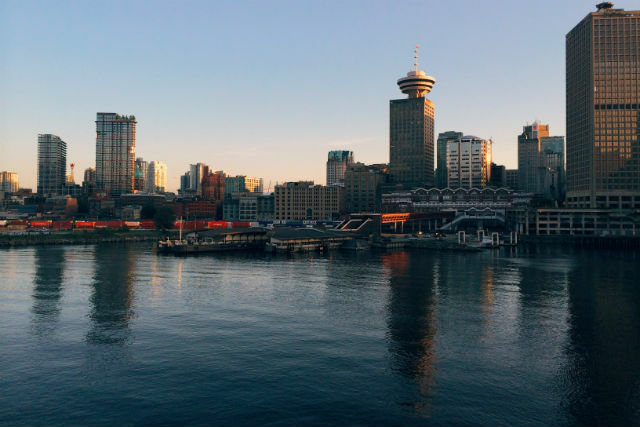 Single-family home prices in Toronto and Vancouver are hotter than ever, but it seems that potential homebuyers aren’t interested in feeding the hype of the market. 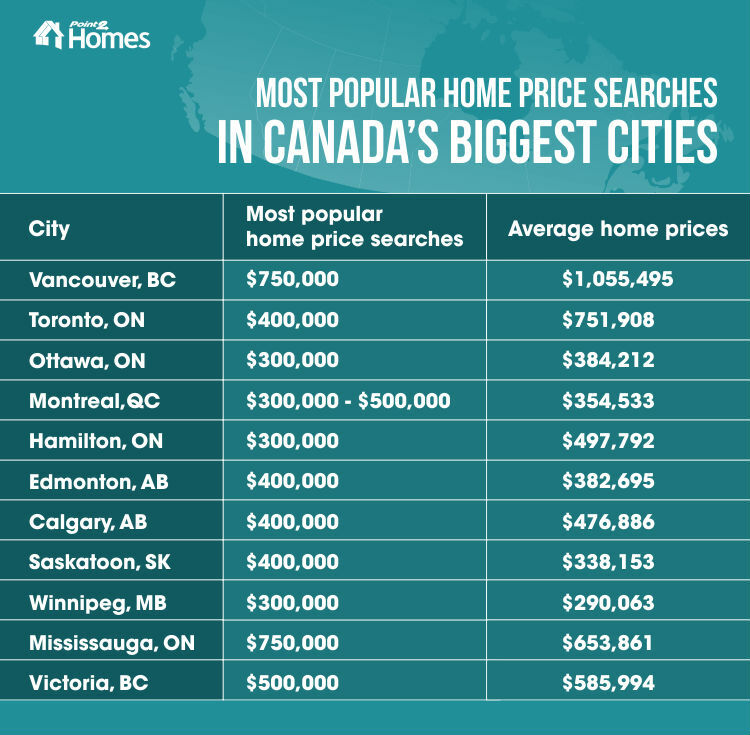 In Toronto, for example, most searches focused on houses priced under $400,000, which is just slightly above half the average home price of $751,908. This highlights a contrast between market and consumer expectations. The biggest percentage of searches (18%) came from young female buyers aged 25 to 34. The data paints a very similar picture in Vancouver as well. 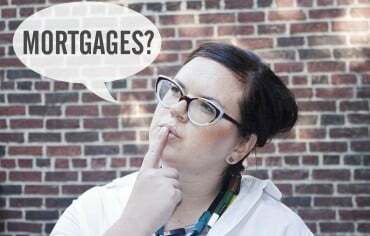 Twenty-two percent of home seekers, mostly aged between 25 and 44 are looking for homes with three or more bedrooms priced under $750,000. Considering the $1.5 million average home price in Vancouver, the expectation to find something below this price is genuinely surprising. Still, three in 10 home seekers in Vancouver are also interested in smaller, two-bedroom homes, probably condos, which might be the reason why the most popular search price decreased this much. This trend of discrepancies continues in Hamilton, Ont. Here, millennials conducted most searches, setting the highest price bar at 40% below the city average ($300,000 vs. $500,000, the average home price)! Three-bedroom homes are also the focus of 50% of searches—and if you think this isn’t very realistic at $300,000, think again, because this list tells a different story. Calgary is another major city where millennial potential buyers are aiming well below the market average. Thirty-two percent of searchers looked for homes under $400,000, while the average home price in Calgary is $477,000. There are still plenty of Canadian cities where the average home price set by the market is in tune with homebuyers’ expectations. Montreal, Quebec City, Edmonton and Winnipeg are the most important of these. Millennials are the most prominent age group in these cities as well, followed by generation Xers. The Canadian real estate market really seems polarized when you compare Mississauga and Saskatoon with Vancouver and Toronto. If homebuyers are only willing to spend far less than the average price in the latter cities, they seem to be willing to spend far more in the former! Just next door to Toronto, Mississauga’s inhabitants have a completely different approach to their real estate searches. The same 25 to 34 demographic constitutes the majority and the same three or more bedrooms criterion applies. But they’re willing to spend as much as $750,000, while the city average is $654,000. In Saskatchewan, Saskatoon’s millennials are scouring for homes priced around $400,000 against an average of $339,000. Next to price, living space is also a very important criterion for homebuyers across Canada. And the trend suggests they want plenty of it. At the national level, almost half of Canadian homebuyers are looking for a home with at least three bedrooms and one-third are aiming for even more spacious houses (four or more bedrooms). Alberta and Saskatchewan residents are especially hungry for living space. Here, more than 80% of homebuyers are looking for houses with three or more bedrooms. Four-bedroom homes are more sought after in Alberta than in Quebec (by 40%) or in Manitoba (by 51%) and by a whopping 54% more than in Nova Scotia. One-bedroom homes are very, very low on Canadians’ lists of preferences: Only 2% of Canadians looked for such homes. They are slightly more popular in Nova Scotia (4%) and Quebec (7%). Ontario: The vast majority of searches are targeting homes priced between $300,000 and $400,000. There is, however, one outlier: Oakville. Here, most searches were performed by people over the age of 45, in search for more luxurious abodes. 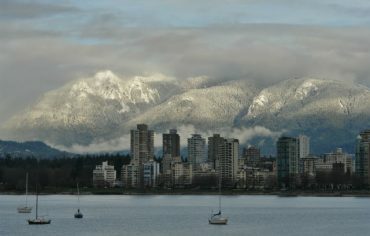 British Columbia: In most cities in B.C., homebuyers are setting the bar low at $750,000, with the caveat that prices have been skyrocketing for the past several years, making properties under this mark quite rare. Alberta: Much like in Ontario, the $400,000-mark is the staple in most searches. And again, much like in Ontario, there’s an outlier: Red Deer. Here, the leading demographic is aged 55 or older, and they’re looking for homes priced above $500,000. Saskatchewan: The $300,000 to $400,000 interval is the norm here as well, with the exception of Prince Albert, a city where searchers aren’t willing to spend more than $200,000 on homes. 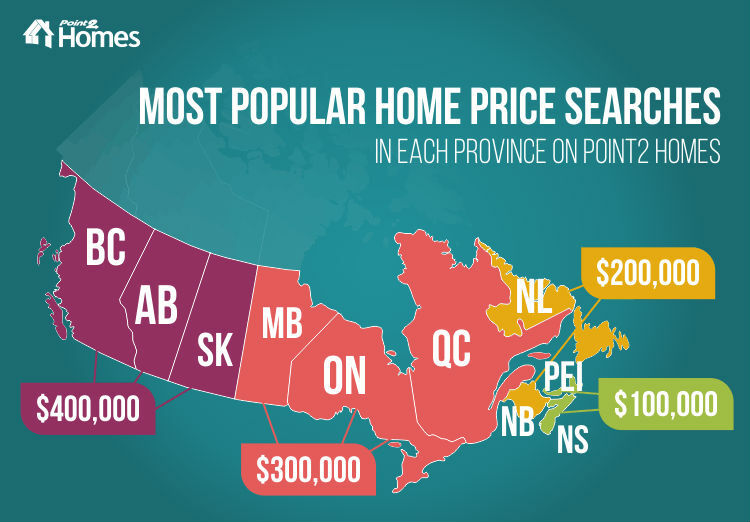 Atlantic Canada: Residents of New Brunswick, Nova Scotia, Prince Edward Island, and Newfoundland and Labrador are overwhelmingly focused on properties priced under $200,000. Ways to Maximize Your Scotia Rewards Points What Should You Do When Student and Credit Card Debts Spiral Out of Control?